PARIS (AFP) - It opened late and millions over budget amid sneering that it was an “ill-judged disaster” that bordered on being racist. And the man who drove the project -- former president Jacques Chirac -- was widely written off by detractors as lowbrow, more interested in beer and sumo wrestling than the intellect. But a decade on, the Musee du quai Branly, the Paris museum dedicated to the indigenous art and cultures of Asia, Africa, Oceania and the Americas, is being hailed as a massive popular success and a bridge between peoples. Now the striking lizard-shaped building in the shadow of the Eiffel Tower is being renamed to honor Chirac, whose passion for Asian and African art was behind its creation. Chirac fought a long battle with France‘s museum establishment to pool their non-European collections. Many experts were outraged that ritual objects and artefacts would be presented simply as art. But true to his old political nickname of “Le Bulldozer,” Chirac rammed through the opposition, creating the grandest museum in Paris since the Centre Pompidou three decades earlier. It will now be called the Musee du quai Branly-Jacques Chirac. A new show at the museum tracing Chirac’s life-long fascination with indigenous art will feature an 18th-century Japanese Buaku theater mask that bears an uncanny resemblance to the retired politician. For years Chirac hid his passion for Asian and African art behind his public persona as “Uncle Jacques,” the amiable bon vivant and flirt. To most of the French public, Chirac liked a glass of lager and saucisson dried sausage, and they were tickled by his love of sumo wrestling. Underneath, though, was a deep-seated interest in the arts of Africa and the Pacific. “I love Japan and I feel at home there,” Chirac once told AFP. Now 83, Chirac was too unwell to attend the opening of the show this week that includes works from his own private collection. “Being president doesn’t always mean you can clear away the obstacles,” joked Hollande, who has faced months of street protests against his overhaul of labor laws. “What was obvious to Jacques Chirac,” he added, was “how could the Louvre remain a great museum if it ignored 70 percent of the world’s population” by not having permanent displays of their art. However, even a decade on from its opening some of the museum's critics have not quite buried the hatchet, bemoaning the “brutal manner” in which hundreds of thousands of objects were taken from four other Parisian museums to fill it. Ethnologist Bernard Dupaigne, whose book “The Scandal of the Arts Premiers” was fiercely critical of its creation and the way part of permanent collection was shown in glass cases reminiscent of Victorian curiosity cabinets, remains largely unconvinced. Nevertheless, he did concede that the museum’s acclaimed temporary shows -- which have been a big hit with the public as well as the experts -- were much better at putting works into their proper context. Nor has the museum entirely shaken off claims that it tends to benefit from greater state largesse than other big institutions. While the Louvre receives only half its budget from the French government, and the Musee d'Orsay a quarter, the Musee du quai Branly gets more than three-quarters. Chirac’s daughter Claude said the museum‘s success was a fitting endorsement of her father’s vision. 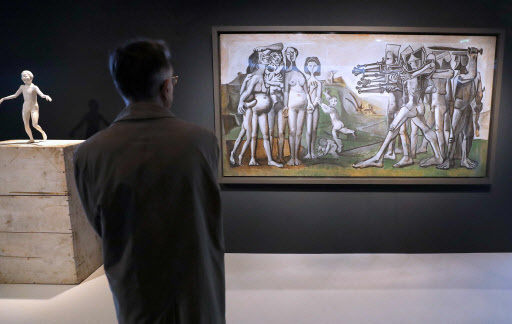 She said he has hardly missed an exhibition since the museum opened in 2006, and “he will see this one, that is certain,” which is curated by his former culture minister Jean-Jacques Aillagon.